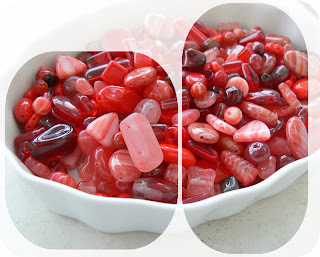 The 4th Bead Soup Blog Party had over 350 participants. This year, I decided to keep the number to 200. 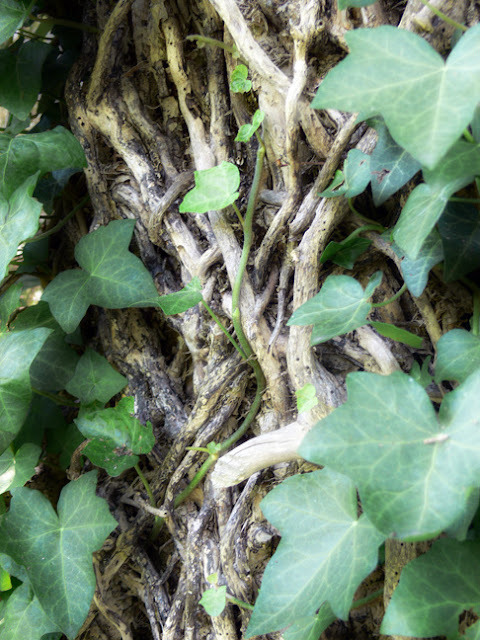 The summer hop, however, all will be accepted, and the hop will be staggered over time so people can get to all the blogs. 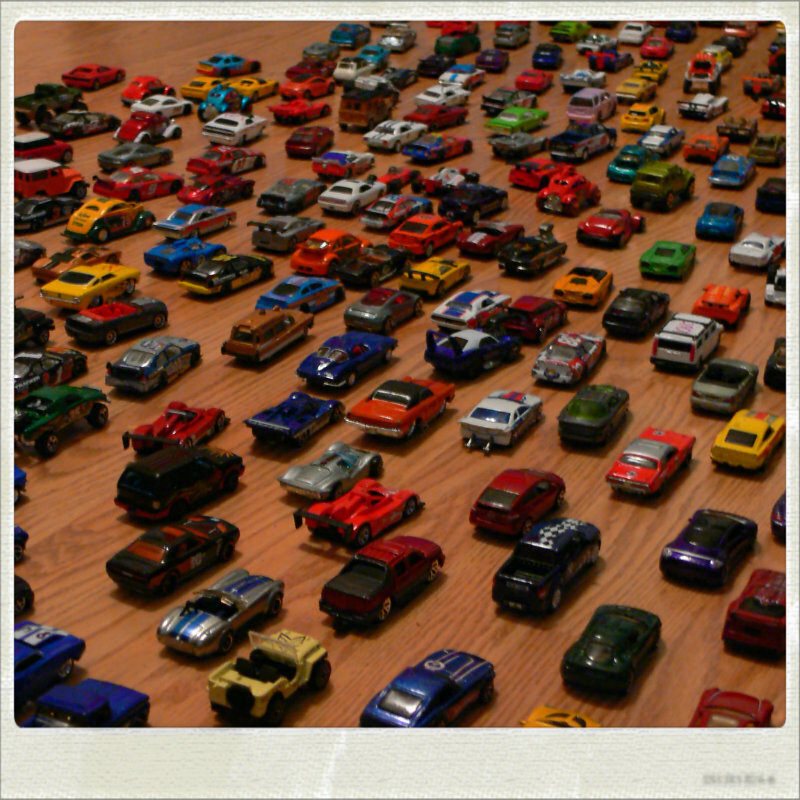 However -- 200 people still makes for an impressive map! Click on it to see it enlarged. There are 16 countries (including some new ones, like Bahrain) and 41 states represented. 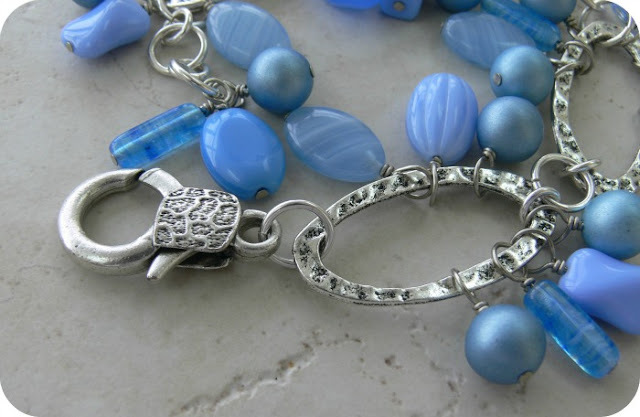 The participants are from all types of beading styles -- metal, lampwork, stringing, beadweaving, etc. -- and I think only one package may have been waylaid (which is a record). Please join us on Saturday to see what these talented people made with the beads they received! and the red pressed glass goes to Pine Ridge Treasures. there are going to be more giveaways soon! 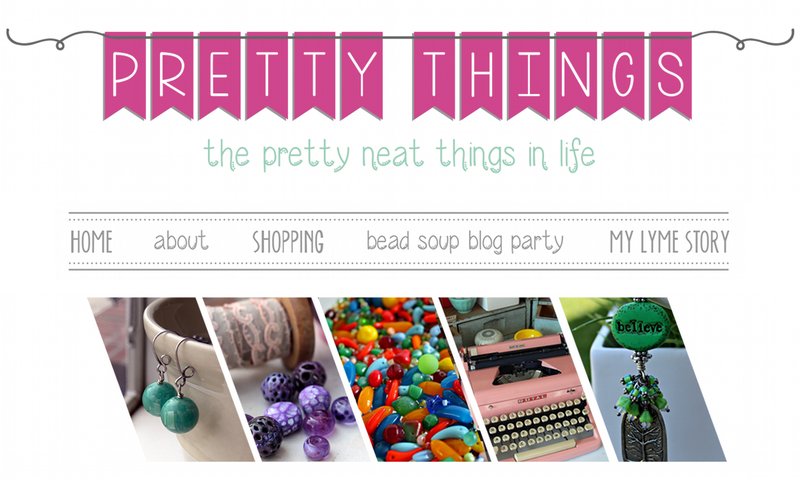 We've finally reached the week of the 5th Bead Soup Blog Party! 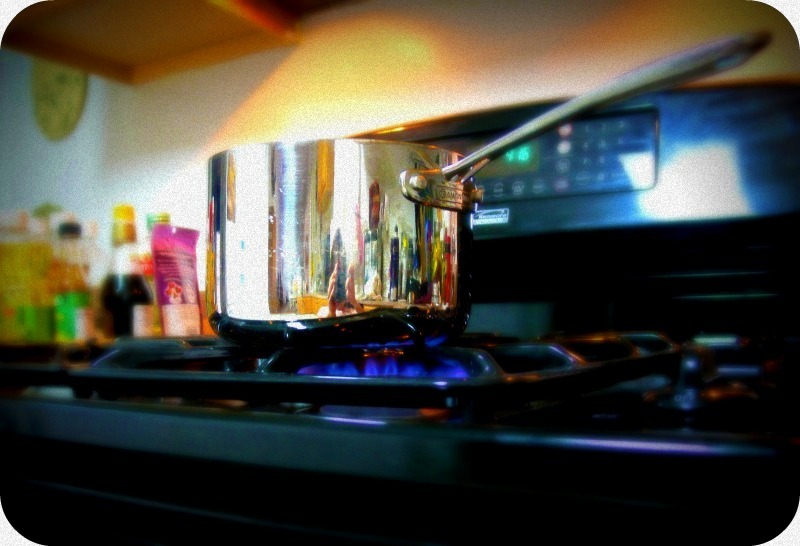 This year the group was limited to 200 people (next time, everyone will be accepted and the hop will be staggered over several weeks) -- but still, that's a lot of burners on the stove blasting at high! I'm always amazed at the number of people who sign up. Last night I expressed my fear to my husband of the day when the blog hop was no longer interesting. He said he didn't think that would happen. I sincerely hope he's right. To that end, would you comment about why you like the party? What draws you to it? And what have you learned from it, if anything? See you on Saturday at the Party! Don't forget the giveaway -- click here. 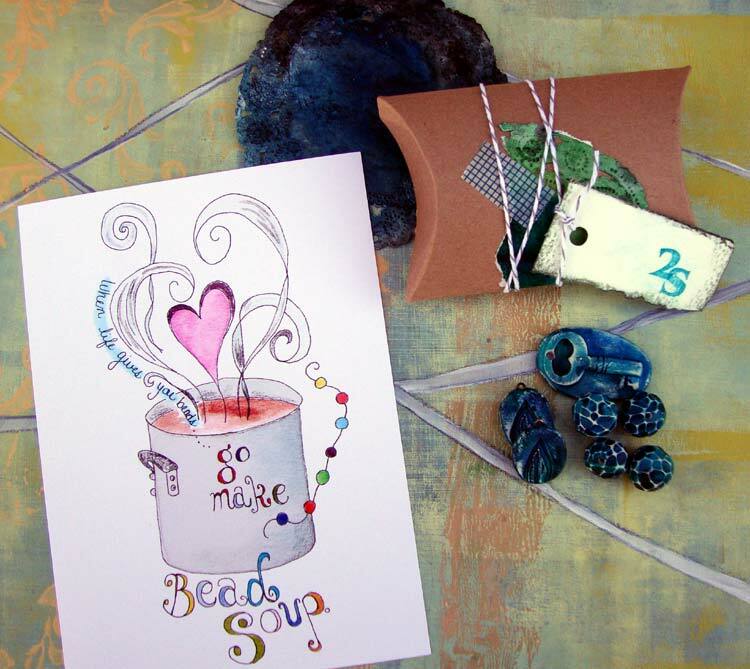 Announcing the NEW Cup of Bead Soup -- it's interactive! and I'm excited to finally start! Now it's your turn to join me! and these three designers will receive the same kit I do. 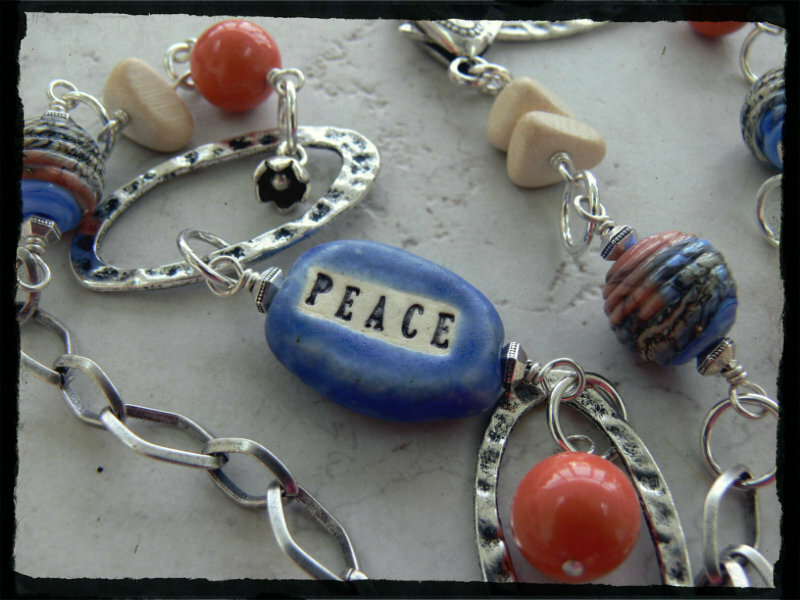 The four of us will then create a piece of jewelry and have a mini-blog hop to show what four people can do with the exact same beads. After the blog hop, the bead artist will have a limited number of kits for sale. 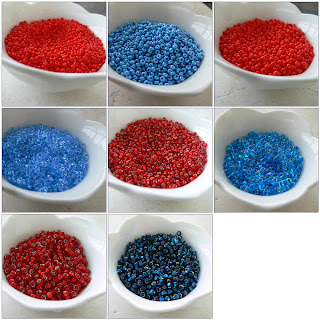 The photos you're looking at are for the March Cup of Bead Soup. 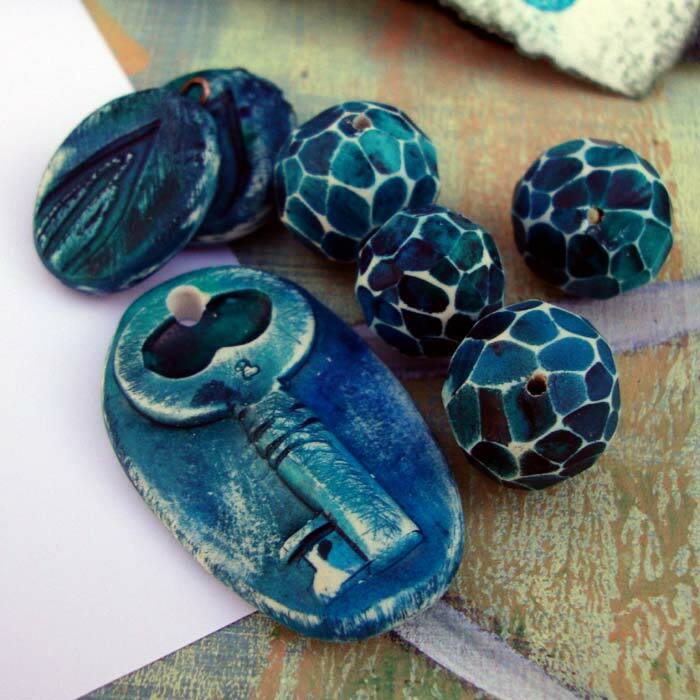 Barbara Bechtel of Second Surf and Floridity is well known for her amazing handmade polymer clay beads, charms, and pendants. 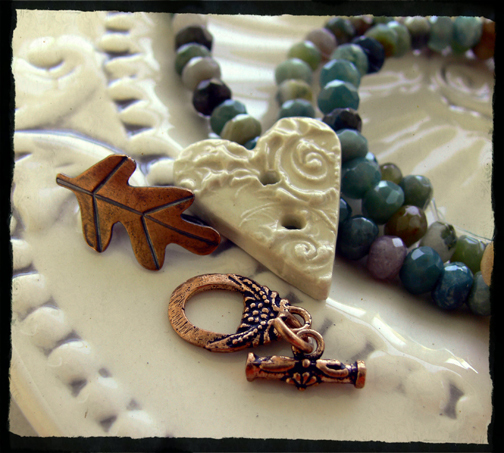 I really love her work (the heart pendant in my blog header is made by her as well!). (Sixteen limited edition kits will be available after the hop for $35). and a way to contact you if you don't have your email in your profile. Comments will close on Monday, March 5th. Mini-hop will be April 7th. More Cups of Bead Soup will occur monthly! Before I announce the winners, here's the story behind this car. When Zack was four, we went on a nature hike in the Tuckahoe State Park. La dee dah dee dah, here we go walking through the woods, when I look to my left. What the what? 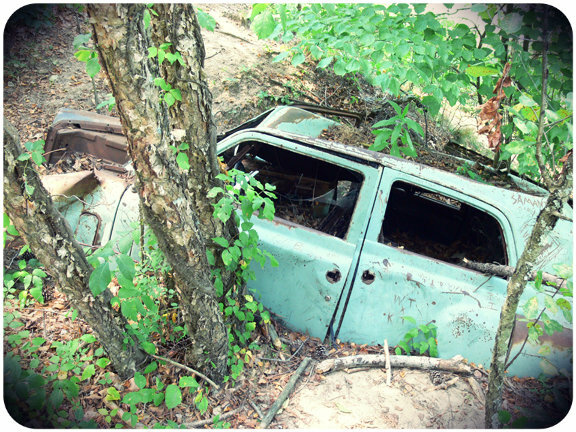 Over the side of the path, in a shallow ravine, lay this car. I was flummoxed. We were on a NATURE TRAIL. No road in sight. 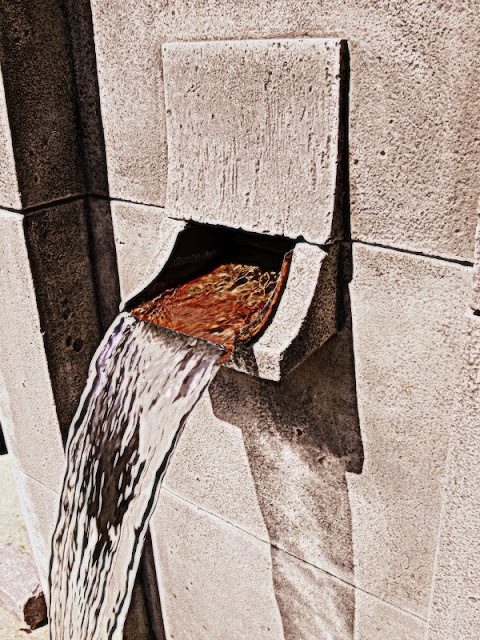 It's like it dropped down from the sky. We were with a school group, and wouldn't you know it, I didn't have my camera. When we got the kids back to the bus, I asked the driver to PLEASE wait so I could take a picture. 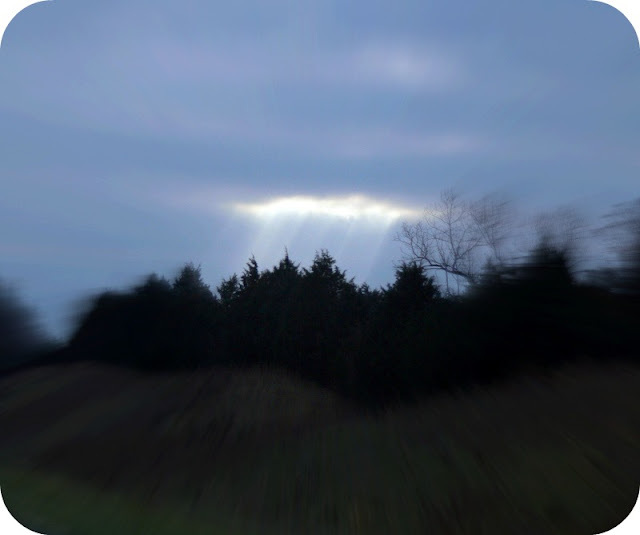 I ran, huffed, and puffed as fast as I could back to the ravine and shot a few quick shots. 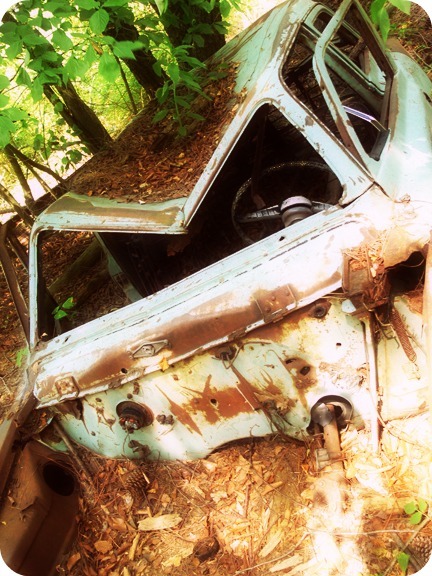 It's one of my favorite things in my "Abandoned" Flickr set. "when do you think insurance is gonna pay the claim for this?" "On Craig's List: Great car, low mileage, unique paint treatment, gently used. OOAK, cash only, GPS coordinates for viewing upon request. " Thanks for playing! I think I'll be doing this sort of post more often! 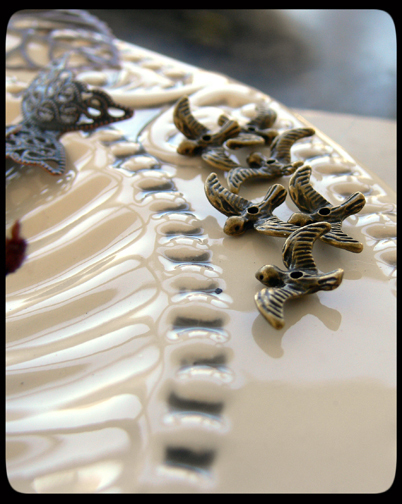 Barbara Lewis is giving away one of her Torch Fire Enameling eCourses! 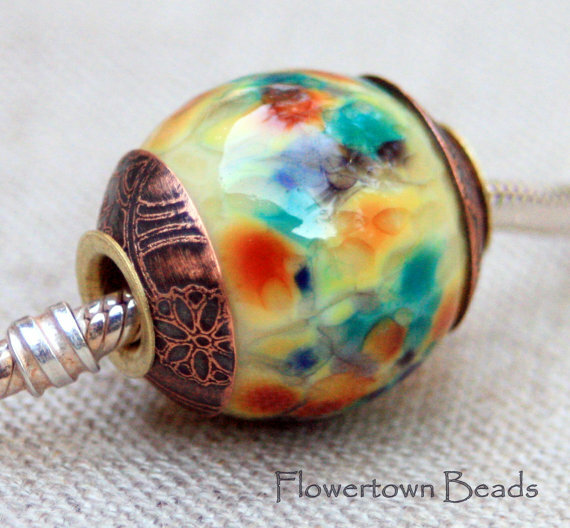 If you've always wanted to try torch-fire enameling but were afraid to try, let me tell you, it's not that hard. Unless you're like me, and tend to pick up beads that have fallen off your mandrel and you know good and DARNED well they're hot as Hades but no, you touch them anyway because perhaps the laws of physics and chemistry don't apply to you. ANYWAY! Click here to enter now! And don't forget to visit my "you supply the caption" contest for a mystery prize. I'll announce winners on Friday afternoon. Leave your caption in the comments section! Everyone here seems to love Zack stories, so rather than show you the amazing candy my husband bought me that I SO. DO. NOT. NEED. (but thank you, honey), I'll show you one of the things I gave Zack. I actually gave this to him yesterday because once it arrived in the mail, I couldn't wait. I'm very bad that way about presents -- I can't wait for The Day. 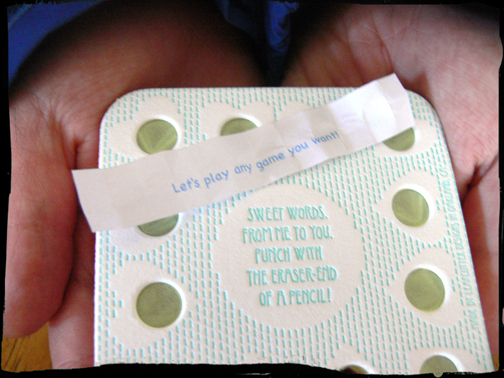 I ordered a punch box from Leafcutter Designs, and wrote out notes. Then they took my notes, wrote them up, and put them in the box. These little boxes are so cool. If you look closely, you can see the folded notes under the vellum. 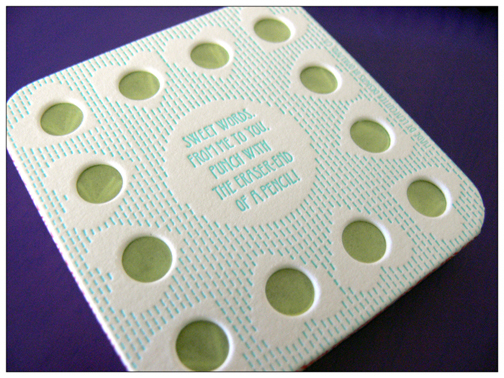 Once you punch through the hole (which goes through to the back) the little folded message comes out. This, of course, thrilled him. I was expecting a card or board game, which is what we normally play, but no -- he wanted me to play a video game with him. We haven't done that in ages, it seems, when we would play video racing games together and all I could do was run off the road or hit walls, which was surprisingly amazing fun. We played a video game called Rayman Origins, which I made him get (yep, MADE him get) because the box looked hilarious. It's essentially like Mario Brothers but with funnier characters and really cool adventures. However, I'm no better at that kind of game than driving games. I only had to worry about three buttons, but of course I completely forgot which was which and just started hitting buttons indiscriminately, head-butting walls instead of enemy flowers, falling down instead of jumping up, and slapping Zack's character instead of the bad balloons. We laughed so much I hurt. And today, after he opened his other presents, he said playing the game together was his favorite. Love that child with all my heart. When I don't feel so swell, or am tired, or just creatively tapped out, I go shopping. 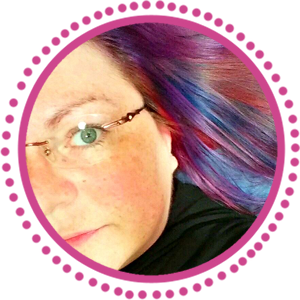 For a while it's been sheerly window shopping, and I wanted to share some of what I've found that I love from afar. 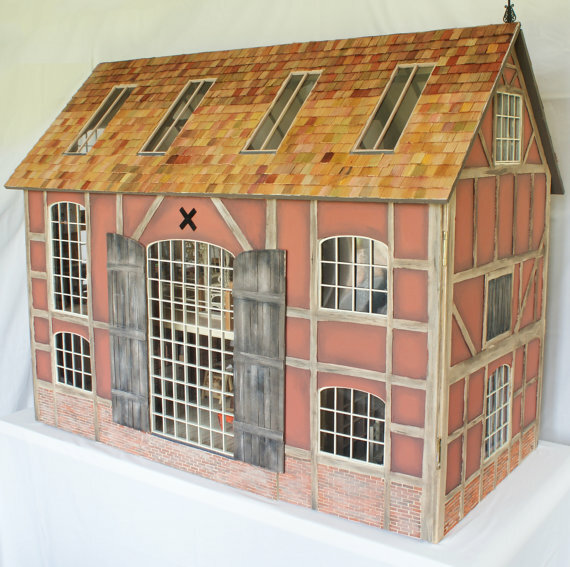 First comes the ultimate dollhouse. You MUST click here to see inside. The interior photos look exactly like a real house. It's hard to narrow down why I love this so much, since there's so much to love! One is the pink exterior. The second is because my dad built my sister and I a dollhouse way back when, and I still have it. Apparently, he was working on that thing all through Christmas Eve, and it was a total surprise to us. Right now I have no room for it in the house -- it's HUGE -- but I refuse to give it up. One day, I'll convert a room into a combination miniature railroad/dollhouse room. One day! 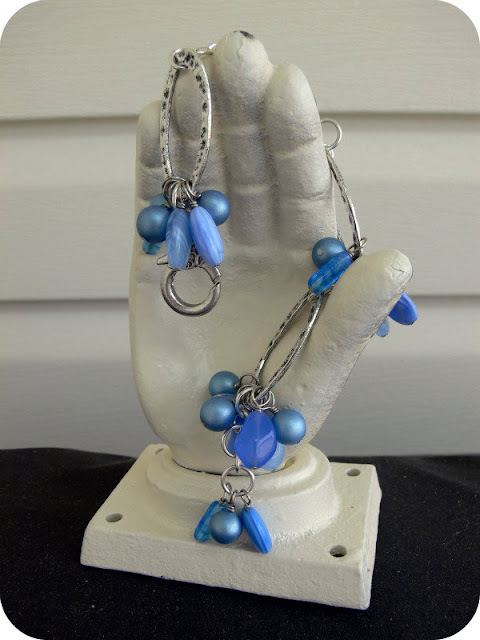 This is made by Flowertown Beads, and she has lots to look at -- not just large-hole beads but sets as well. This is made by Xanadu 2 You. 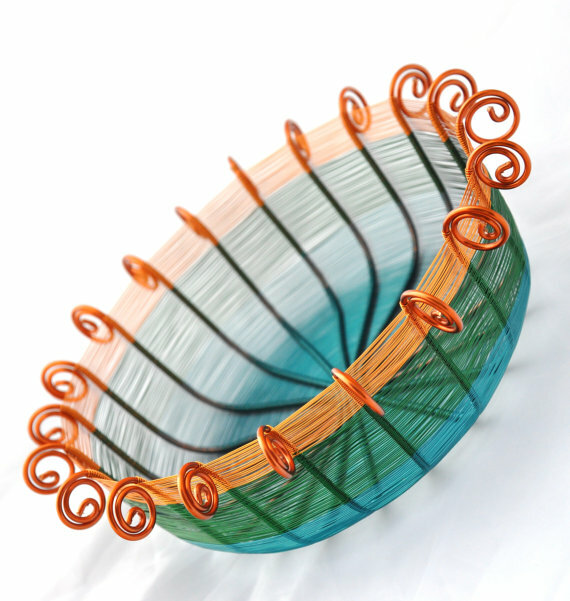 Not only does she make these gorgeous bowls, but jewelry, too! Stampadoodle has a lot of cool metal stamps, most of which I've never seen before. 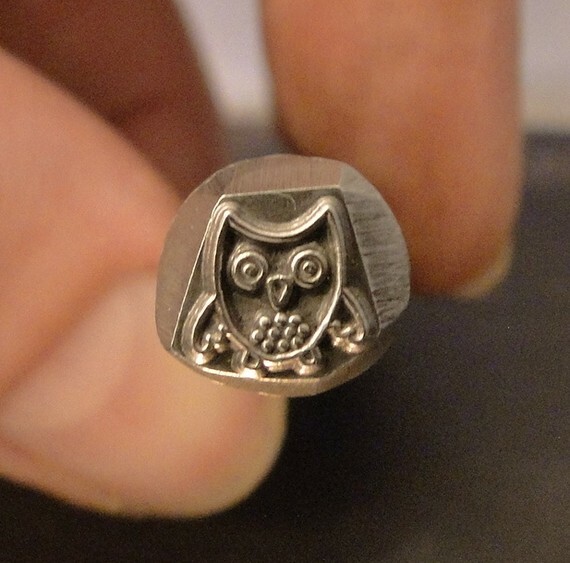 She also has stamping blanks, so if you've never stamped metal, give it a whirl! And of course, I'm sure you know how much I love books. So this print should be no surprise. 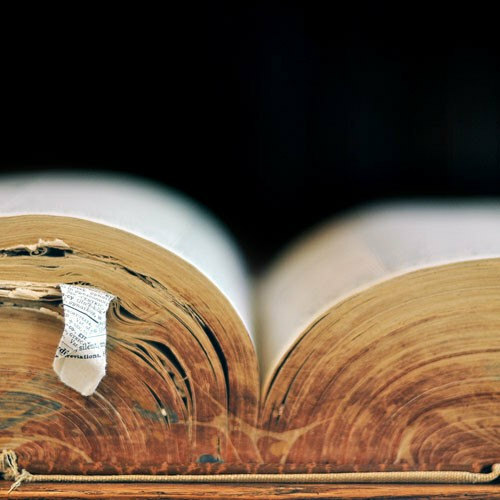 Photographer Elle Moss really captured everything about books in this one. There's a used book store near my town and I spend HOURS in there. In fact, I'll be opening a vintage store sometime this year with some of the amazing finds I've collected. since of course, one can never have enough beads! These clever triangle beads are made by Mitosis Glass. I love the shape and the color is very summery. I hope you enjoyed your shopping trip with me! 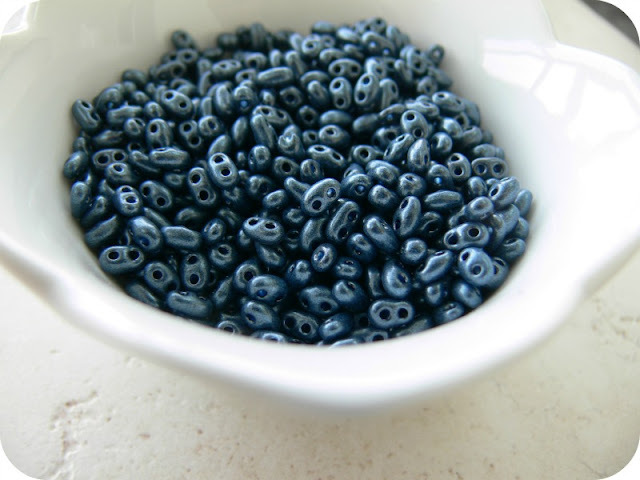 Finally, I'm posting my bead soup! I had tried to put them in collages, but decided each photo really deserved it's own individual shot, so there's lots of pictures in this post! Marcie sent me two soups. 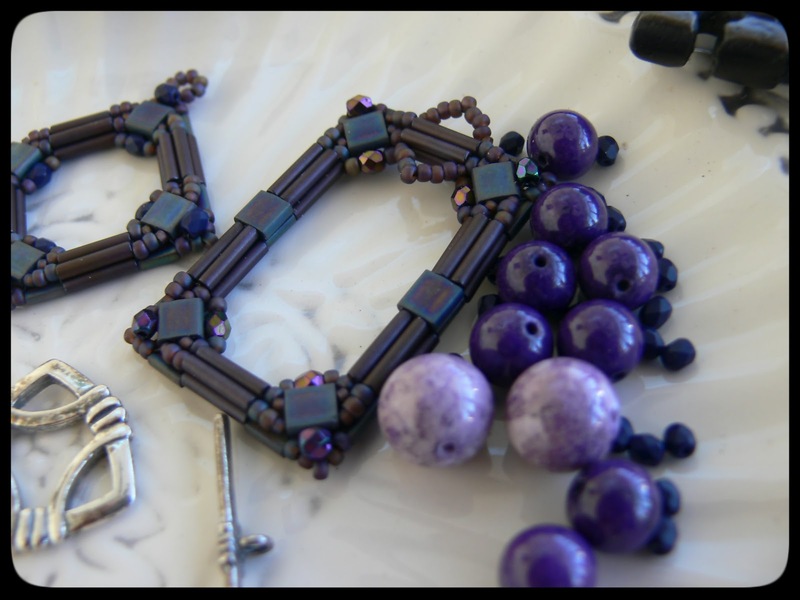 One included two handmade seed-beaded focals, two shades of charoite, and some tiny Czech beads. The toggle is a terrific geometric piece. I have absolutely no idea how she does these things with little bitty beads. I've already made a necklace, a bracelet, and earrings, but that last rectangular frame has me a little stumped. I like that, though, because it's making me dig into recesses of my bead cabinet that haven't been explored in a long time. 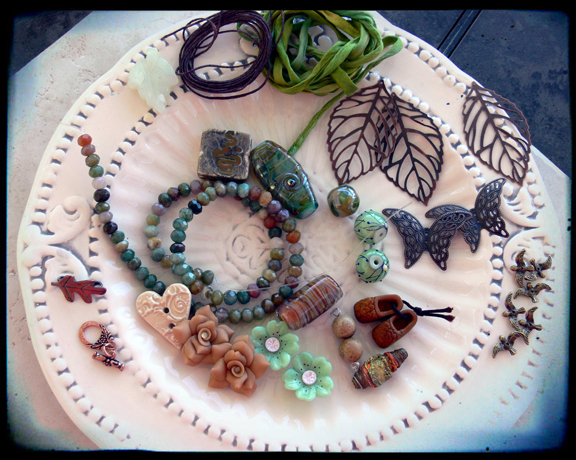 She also sent me an earthy mix -- and this throws me off because I'm not an earthy girl at all. Again -- this is a good thing. 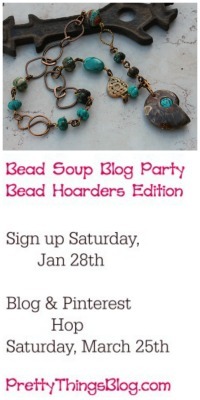 The entire point of the Bead Soup Blog Party is to be pushed creatively. Isn't that jasper focal to die for? 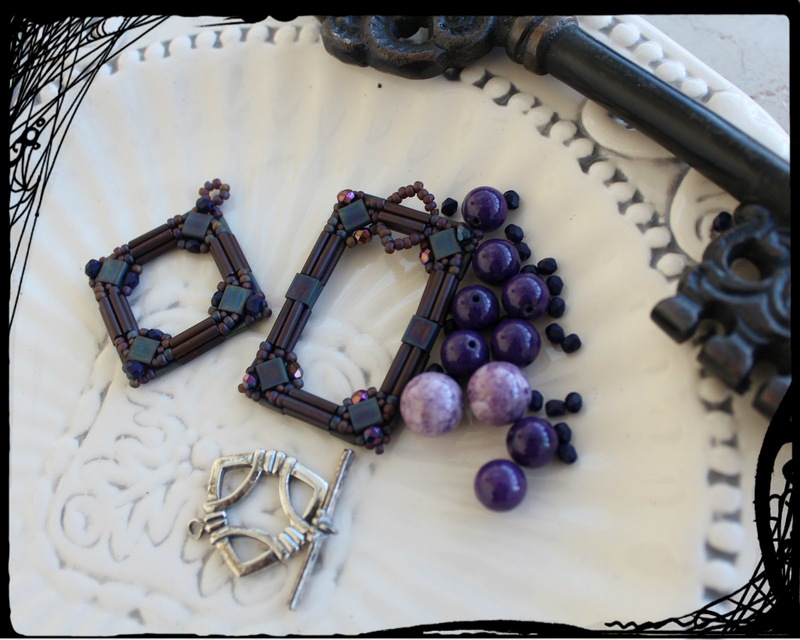 There's also some very cool copper rings I've never seen before, Elaine Ray diagonal cubes, and Czech glass beads and leaves. I love that copper toggle, too, because I've not seen it before (love new things!). Next comes the soup from Rebecca. Rebecca also sent me a couple of gifts. She knows I devour books like candy, and this particular book is her favorite. She also sent me a fun pair of button earrings. 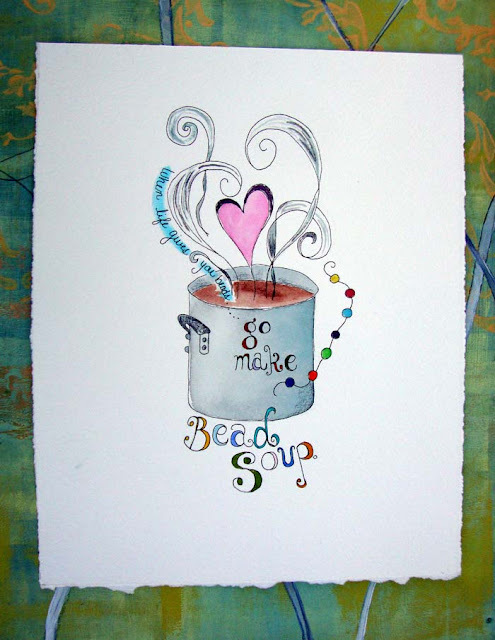 Rebecca described her soup as a soup stock she kept adding to. I love that, because it's how I mix a lot of my Bead Soups. She included a clever letter with drawings of the beads and descriptions and sources -- very handy! This is the majority of the soup. As I mentioned before, I am not an earthy girl, and green falls into that category. So again -- work cut out for me -- and I relish that. The silk cord scares me. I stink at cord and fiber. But I'm going to give it my best! How about a closer look? She said she tried to use all overseas sources, so click their links to buy your own! 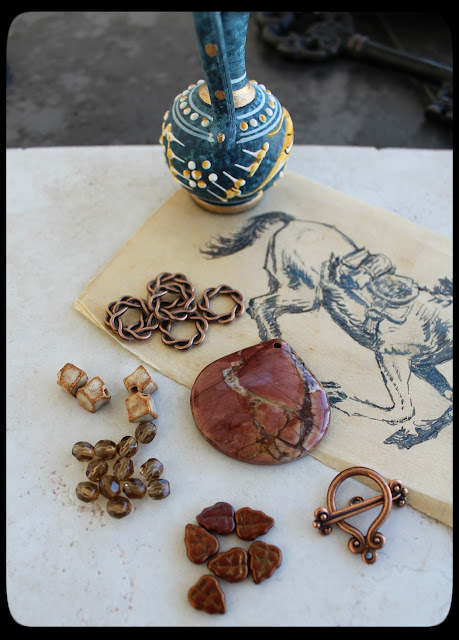 Potential clasps -- a leaf hook, a copper toggle, and a ceramic button. OMG, the birds. Love the birds. 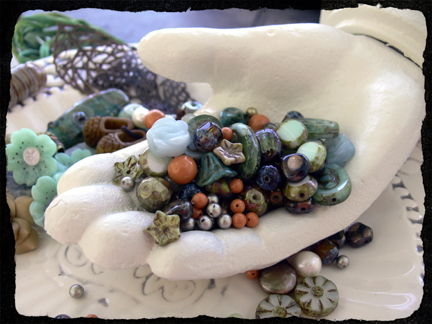 Some may have to fly over to Marcie's earthy mix. 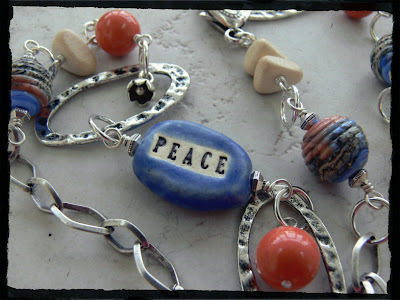 I know you can get these from Ornamentea in various metals. 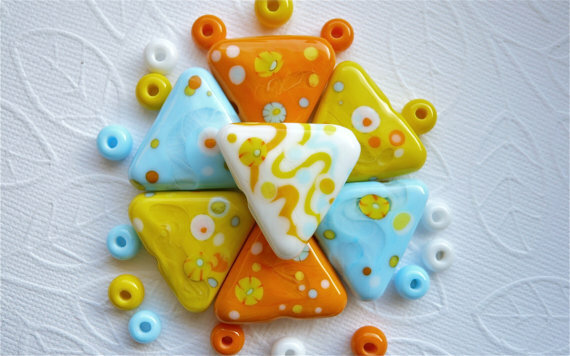 A lovely handmade glass focal by SowZere Beads. And can I just say how much I love Moogin Mindy's bead pair? I recently got some beads from her and I'm hoarding them. In the back is a square lampwork bead that is SO COOL by Helen Jewellery. And then the awesome copper leaves. 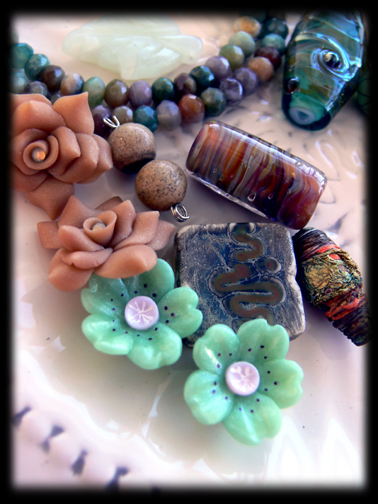 polymer clay flowers, and a pair of organic lampwork beads. OK. Does it surprise anyone that Zack stole these? I have to hunt them down now. 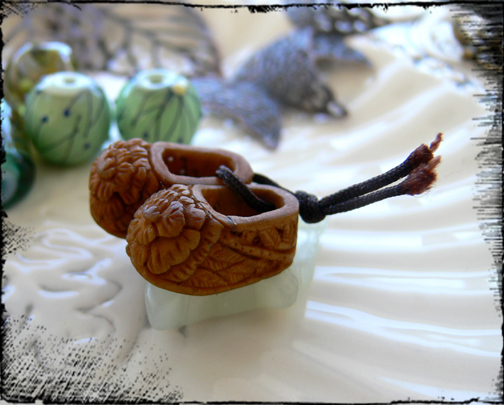 They're adorable baby shoes, aren't they? And lastly, the beads that didn't fit in the first photo. 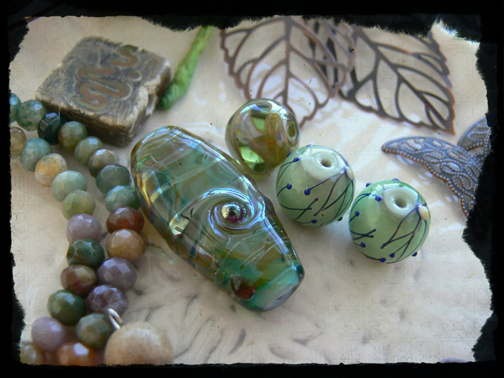 Lots of Czech glass and other pretties. Did these ladies spoil me? But they also threw out the challenge, and I hope I can make them proud. 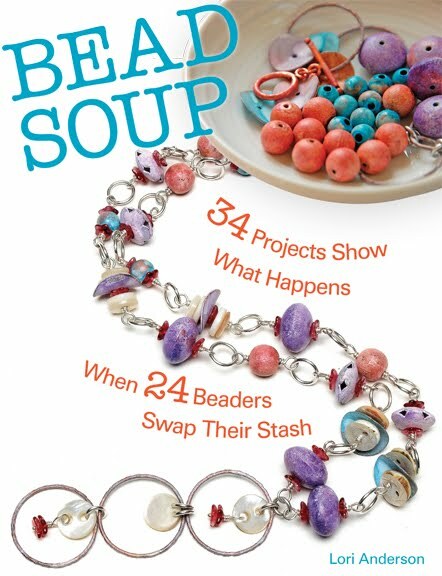 The Bead Soup Party reveal is March 3rd!!! !